UPDATE (next day): You can read the postmortem report here! 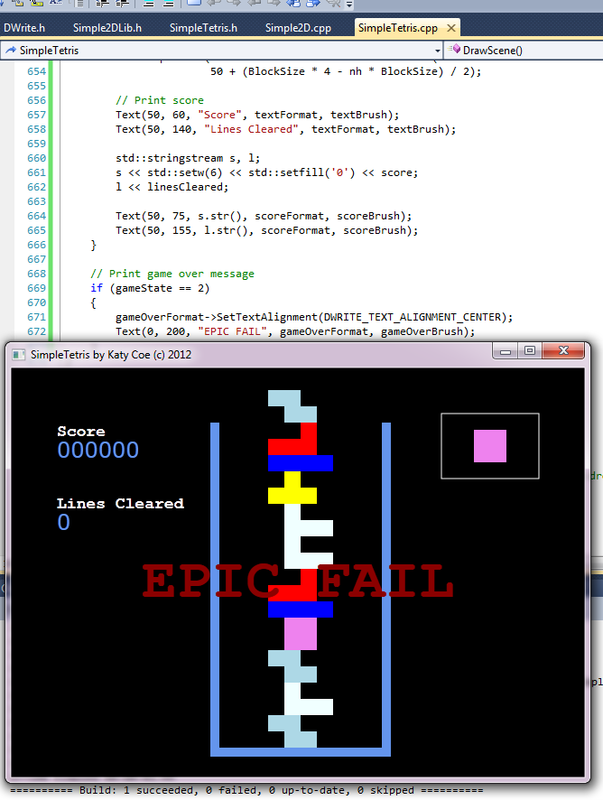 Can I write the entire game of Tetris in 8 hours or less using my Simple2D wrapper library? Let’s find out. I’ll update this blog as I go! 16:00 – GO GO GO! 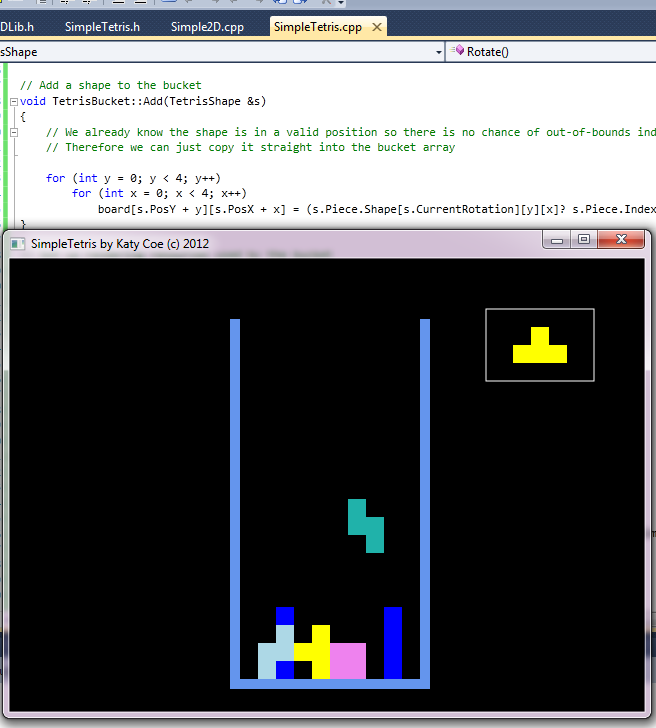 Goal: Create project, find dimensions of Tetris grid, initialize graphics sub-systems, draw grid. A tetris bucket is 10 x 20 apparently. One and a half hours in. I created a four-dimensional array of 7x4x4x4 to store the 7 possible shapes, each with 4 possible rotations, on a 4×4 grid which is essentially the bounding box for each shape. I created a class TetrisShape for this, however I have made it kind of sloppy, it is leaving most things public and the drawing routine for the shapes is actually in the rendering class rather than the shape class, conceptually better but it does mean numerous properties of the shape class have to be public, and the code is messier to boot. But we don’t have time to be elegant. I used a 4x4x4 array for each shape because it is less messing around than writing a rotation algorithm that uses the correct (different) centre of rotation for each shape according to the original game. I will probably have to tweak the position of some of them. 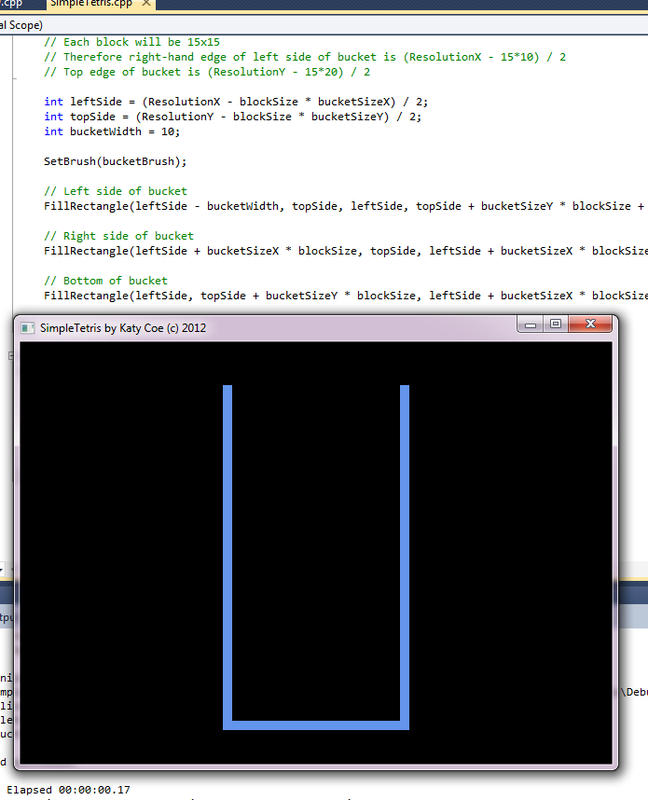 I split the code up into a .cpp file and a .h file since the shape class and renderer class both reference each other. Brush resources now have to be freed in the application rather than Simple2D as we have created an array of them dynamically, one solid colour brush for each shape type. The y-position of the shape is adjusted on creation so that any empty rows in the 4×4 bounding box are conceptually above the top of the bucket. The x-position is automatically centerised. So far then, all the shapes are configured, the first two shapes are chosen and have their positions set up correctly, and the first shape is rendered in its initial position. When moving left, right or down, we only need to check the left, right and bottom sides of the bucket respectively and this is quite simple. Fast drop simply emulates moving the piece down one row at a time until it can’t go any further. Rotation however, is much trickier. My first attempt to allow rotation, and move the piece left, right up or down if the rotated version was outside the bucket – to force it to stay inside – failed because the center of rotation of some pieces is such that doing this can lead to a situation where pieces flush against one of the four bucket edges can end up shifting one row or column if the non-rotated piece was snug against an edge and the rotated piece would not be partially outside the bucket. Rotation is (at the moment) always allowed, and the rotation algorithm first tests the piece to see if one of its edges is against one of the edges of the bucket, then rotates it, then for each side that the piece was against, moves it so that the new rotated piece edges are aligned against the same bucket edges as prior to the rotation (this includes the top of the bucket). No new pictures to show this time but you can now move and drop the first piece (arrow keys) and rotate it (left CTRL), so download the EXE and give it a go! 714 lines of code, 3.5 hours in. I’m getting hungry. Some earlier parts of the code can now be re-factored using later written functions. The code which puts a new piece at the top of the grid now uses firstUsedRow() instead of a while loop to set the piece flush against the top of the bucket correctly. I removed the four isPast*() functions and re-factored the Move functions. I also removed a lot of unnecessary code duplication in the rotation function. Now we are down to 620 lines of code. Right now, when a piece reaches the bottom it will just vanish because we haven’t made a place to store the contents of the bucket (game board) yet… and that is what I shall do next! Whew this took quite a bit longer than I expected. I made a perhaps questionable design decision to re-factor the code such that the bucket was its own class and so were individual piece types, on the one hand clearing up a fair bit of array mess but on the other hand introducing perhaps unnecessary complexity. I never meant to make this heavily OOP and I’ve made a point of avoiding the use of things like operator overloading and dynamically allocated objects (wherever possible) to keep it simple for the beginning game programmers! I also spent a little while now battling a crash-on-exit bug which may still be present in this EXE – I couldn’t reproduce it in the end, so let me know if it stings you. So two new classes are introduced: TetrisPieceType of which 7 are created at the start of execution, each containing full information about a specific type of piece: its layout in all rotations, its colour (Direct2D paintbrush resource) and an index that makes it easy to identify. 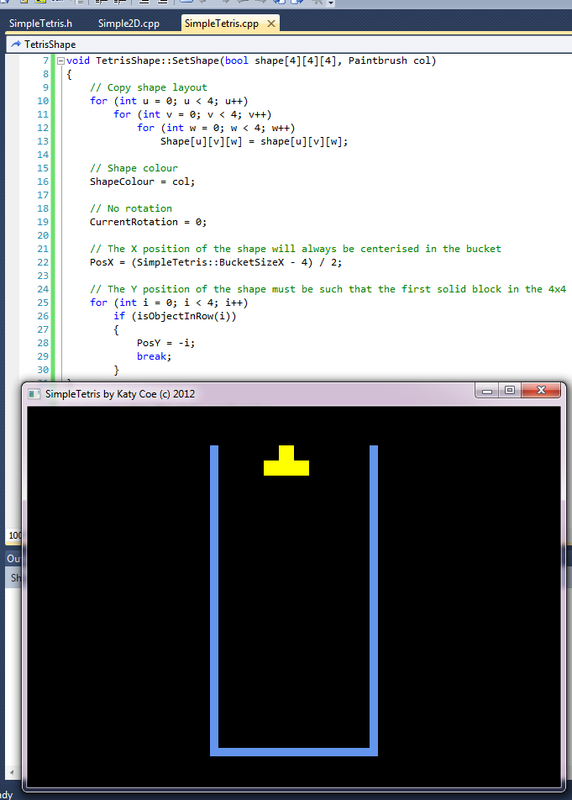 The second class is TetrisBucket which has the game board itself. At the start of the game, all the bucket rows and columns are set to blank which I’ve represented as -1 (minus 1) in the code. When a piece can fall no further (or you use fast drop), it is written into the bucket; that is to say, the non-blank portions of the piece type’s bounding box contents are written into the bucket. The bucket is stored as a 2-dimensional array of ints. To make sure all previously dropped shapes get re-drawn on subsequent frames with the correct colour, each grid square in the bucket is associated with the index number of the piece type which fell there. The actual shape is discarded and the bucket is just a jumble of different coloured blocks that aren’t connected to each other. Once the current piece has been written, it is discarded, the next piece is set to the current piece and a new piece is generated as the new ‘next piece’. This version also draws the next shape in a box in the top-right corner of the window, which required implementing a new drawing routine that could centerize a piece in a bounding box. I had to make a small modification to Simple2D to allow the resolution (width and height) of the window to be accessed outside the class object. Two hours to go: I’m feeling the time pressure now, it’s sweltering hot in here, getting dark and I really need a drink, a smoke and some food! This was quicker than I expected so I’m more or less back on schedule now. 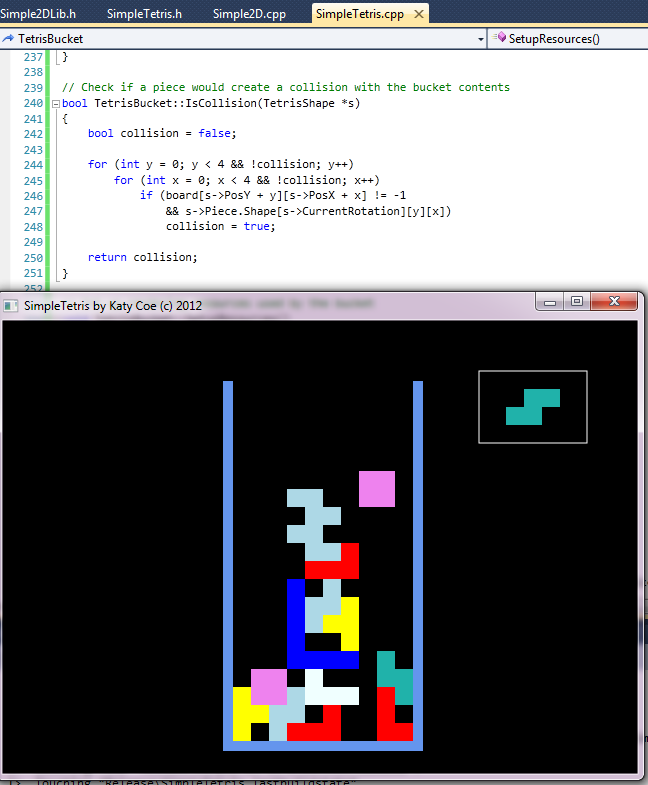 The collision detection is working; I was a bit cheeky and just disallowed rotation if it collided with another piece on the board; in reality the piece might get shifted a little bit but this is for all intents and purposes an unusual edge case scenario, and real Tetris also disallows the majority of such rotations. Next up I have to detect when lines have been filled, remove them, keep and display your score, and handle the situation where the grid gets full. Yes, I really prefer mine better to be honest. 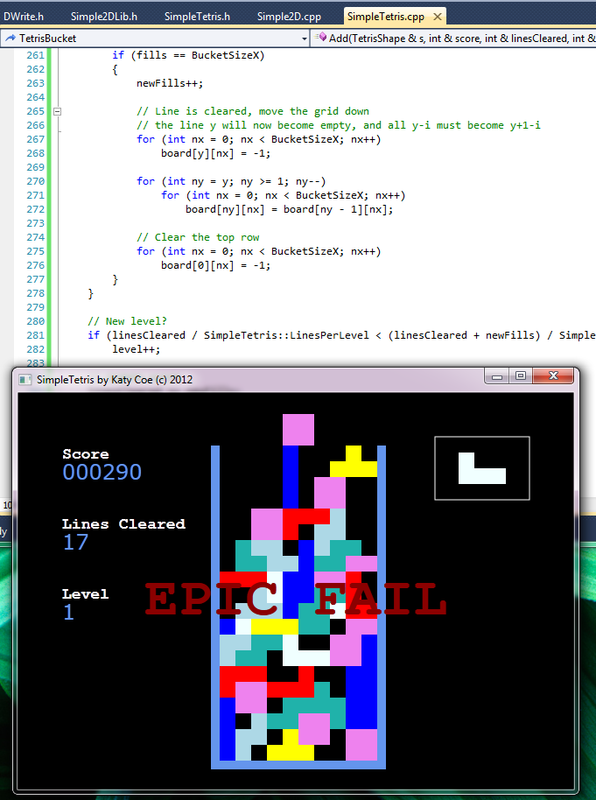 Anyhow, that wasted a lot of time, I threw in the code to check for the game over condition (if the next piece already collides with something on the grid when it is first brought into play), and the gameState now has three options: 0 for no game started yet, 1 for game in progress, and 2 for game over. This should probably be re-written as an enum. 15 minutes left, no time to chat! Scores, level, line clearing, grid moving when line is cleared, and bonus scores for multiple lines added. That … was CLOSE! Read the postmortem (written the following day). Great idea. Keep up the good work. Can I look at your main()? How are you implementing the game? Hmmm, Very cool….however, I get a few functions as undefined when I compile it, if I uncomment them it works, but the keyboard does not work. The exe downloads and runs properly though. Any ideas? Did the Simple2D library ever have these functions? Awesome site, looking for simple games to teach elementary school kids coding! where i can download Simple 2D library?